The new Safe Escape Smoke Hood, Model ASE 30, will protect you from smoke inhalation and many other toxic gases. It is guaranteed to give you up to 30 minutes of breathable air whether it's smoke in the engine room or main cabin of your vessel; in the cockpit of your aircraft; or, a fire in your office, hotel or home. After extensive evaluation, we believe the Safe Escape Smoke Hood is the most effective low-cost respiratory protection escape device (RPED) you can buy. 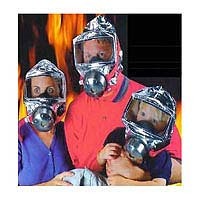 The New Safe Escape Smoke Hood smoke hood will protect you from smoke inhalation and many other toxic gases. The technology used is licensed by NASA. Flame and Radiant heat up to 1400°F the ASE 30 Safe Escape Smoke Hood is guaranteed to give you 30 minutes of breathable air in an fire / smoke / toxic gas environment. The hood/mask is flame -resistant, aluminum foil cloth, which will withstand 1400 degrees F which protects the head from flame, thermal radiation and dropping dust and ash from fire. Sealed in a soft plastic carry bag with glow in the dark labeling that is portable enough to take with you anywhere. The Safe Escape Smoke Hood comes with a Five ( 5 ) Year Shelf Life Warranty from the date of manufacture; and, the manufacturer offers a free replacement for any Safe Escape Smoke Hood used in an actual Fire / Smoke occurrence during that period. Provides protection against many other toxic gases and smoke as well as hot falling ash. For the PurifyAir 30M, CE / European Certified, Smoke Escape Hood, please contact us. Further information and (20) unit case lots available. For the Marine Emergency Escape Respiration Apparatus, model AFSY20, CE and IMO - International Maritime Organization compliant, please contact us. Further information and (20) unit case lots available. 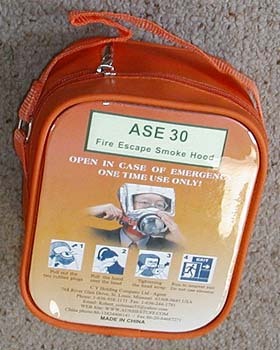 Click the button below to add the ASE30 Smoke Hood (30 minute protection) to your wish list.